My Flickr friend Charlie sort of turned up trumps today. We headed off to Naples to pick up an earring I had left there. It turned out the main street was completely closed and there was no parking to be had anywhere. It was a chalk paint festival. Loads of people painting on the road all the way the main streetcar charity. We ended up parking and having to walk about a mile back into the centre. However, it was good fun wandering up and down the street looking at all the art, but also the people themselves, and there dogs. They appear to be dog mad here and we even met a lady with a standard poodle that was all the colours under the sun. We then headed off to Marco Island where Charlie had given me the name of the road where he took his owl pictures. But before we got there I spotted what I thought was an owl, or could have been an owl, and it was! Loads of pictures later we headed off to Lamplighter Road where we were headed. But nothing. We went back to where I had been photographing and my owl had been joined by a baby, or his missus, we are not sure. Hence the pic attached. I really love them and am delighted to have had another opportunity to photograph them. There are loads of sites both in Marco and in Cape Coral (the only two places they are found), but we could only find this one outside. 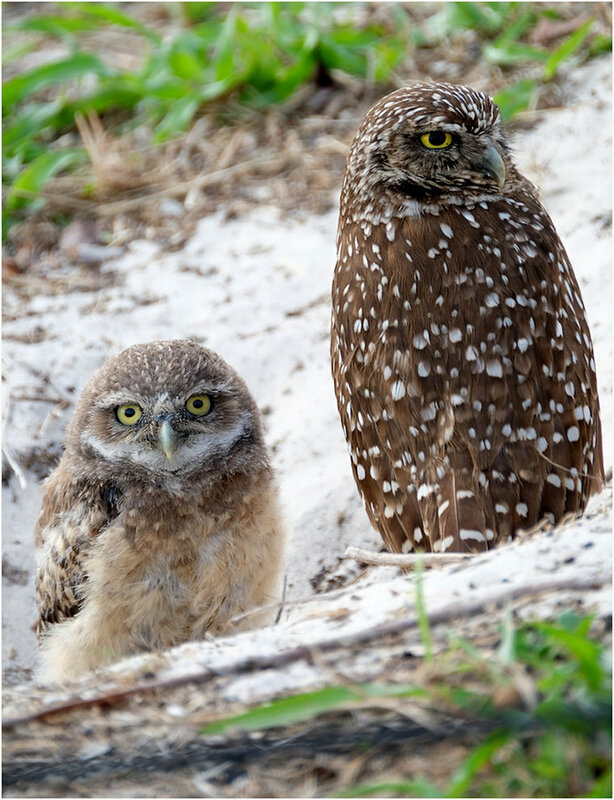 There is a Burrowing Owl Society where they keep a strict watch over them because they are mostly in residential areas. We really need to come back in April or May when they are sitting on their little perches. This afternoon was a bit of an education. Everyone here appears to eat out and some places are obviously more popular than others. One such place is Carrabas, an Italian restaurant chain. We have learned that the Americans eat out at about 5 pm, and have therefore taken to trying to get a table at 4.30 before the rush. Tonight we arrived at Carrabas at about 4.20 only to be told that we would have to wait about half an hour for a table. However, they have these tall tables down the middle which seat about 6, and also high tables at the bar. These are first come first served. As some people left I made a run for two seats on a six seater table. A US couple, residents of Bonito Beach, joined us and later another local couple. I have never in my life seen so many people waiting for tables. There must have been in excess of 30 people all the time. People were negotiating with you for your seat as soon as you left. They also had on an offer that if you had a certain dish you got a free lasagne to take away. We gave ours to two ladies who we were sitting with, who had bought a cool box! As we were paying out bill people were lining up to rush for our seats. It was bedlam. I said to Geoff we should stand up and then sit down again! We are moving on tomorrow and travelling North to Sarasota for a few days. We love it there and it is one of the few places on the Gulf, that you can easily get to the beach. And what a beach. Siesta Quay is the most beautiful beach I have ever walked on. It is like walking on Johnson's Baby Powder. I hope nothing has changed.